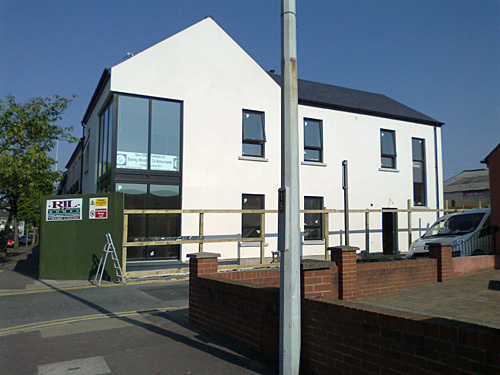 This Summer Stanley Woods & Co will be relocating to new offices in Church Street, Newtownards. This will give us a ground floor reception and meeting areas and purpose built facilities. Construction work is well under way and moving along nicely. We will keep you updated as to progress and likely time of the move in due course. This year sees Stanley Woods & Co reach 75 years as an accountancy practice. Further details will be posted here later in the Spring. We have available two tickets for Ulster Rugby’s Heineken Cup match with Leicester Tigers in January 2012. This draw is for existing clients of Stanley Woods & Co only. The winner will receive two tickets for the old grandstand for the above match, which will take place on the weekend 13th to 15th January 2012. If you are interested; simply contact the office with your details before the 21 December 2011. The winner will be drawn at random from all entries received by the closing date. The draw has been made and the ten pairs of golf vouchers are now winging their way to the lucky winners; hard luck to those who were unsuccessful but keep an eye on our website for more client draws in the future. We hope that all winners enjoy their prizes and look forward to hearing how they all got on. We have available 10 pairs of Golf Vouchers for a free round of golf at Donaghadee Golf Club this summer. This offer is for our clients only, although they may take a guest with them. The vouchers must be used by the end of September 2011. There have been major changes to the penalties that will become payable for failure to lodge your Tax Return on time. Any late returns will face a minimum penalty of £100, even if only a single day late, and these after 3 months will increase by £10 per day. Remember that the deadlines are 31 October 2011 for paper returns and 31 January 2012 for filing online and Special Cases. Make sure that you do not get penalised, get your returns in early! The 2011 Tax Returns and Notices to File will be issued shortly. The filing deadlines for the 2011 Tax Returns are 31 October for those filed on paper and 31 January 2012 for online filing. Penalties will become payable if returns are filed after these dates, so make sure that all information is supplied as early as possible to enable them to be properly completed and filed. Special cases, which can only be filed on paper, are treated the same as online returns. Help us to help you and avoid penalties! As we head towards the end of the 2010/11 tax year it is again time to make sure that all possible relief has been obtained. Pension contributions must be paid before 5 April to obtain relief in this tax year. Capital allowances – the annual investment allowance available at 100% on spend up to £100,000 will reduce to a ceiling of £25,000 from 6 April 2012. Make sure that you keep a note of any gift aid payments made during the tax year. Remember that if profits are rising and the 2010/11 tax liability is likely to be higher than 2009/10, then the balance of tax will not be payable until 31 January 2012. At the same time as a payment on account for next year. This can cause a sizeable “spike “ in tax payments next January. If this is likely in your case then an early completion of the accounts and returns will give you time to gather the money. If the 2010/11 tax liability is likely to be lower than that for 2009/10, then making sure that the accounts and returns are completed before July will enable you to reduce the tax payment due on 31 July. We are always available to talk over individual cases with out clients, so do not hesitate to get in touch. Newly self-employed? – We can help. If you have recently commenced self-employment then you may need advice to ensure that all your revenue requirements are properly dealt with. Please contact us to arrange an appointment to talk to one of our friendly efficient staff. You are required to register with H M Revenue and Customs within three months of commencement and the relevant forms to enable you to do this are available to download on our downloads page. – See forms CWF1. The VAT Online filing system is now up and running, if you need any advice or assistance in regards to filing your returns, or wish to have us file them on your behalf, then contact Eileen for more information. Help, whenever you need it!